Salem Correctional Center is a medium/minimum security prison located in Industrial West Virginia. The facility houses 388 adult male offenders. Inmates are secured by multiple razor wire perimeter fences, and a variety of electronic systems. Salem Correctional Center operates a 64 bed residential substance abuse treatment program. This facility offers adult basic education to offenders and provides transition programming and life skills classes. Inmates can also participate in vocational training that includes heating ventilation and air conditioning, culinary arts and plumbing. 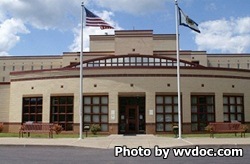 A Master Gardening program is provided to offenders through West Virginia University. Inmates at Salem Correctional Center can participate in religious worship services offered through the chaplains office. This facility also provides work crews that provide labor to various agencies throughout the area. The visitation hours for Salem Correctional Center are currently unknown, contact the facility at the telephone number provided for the current schedule. If you know the visiting hours for this facility please help us out by leaving a comment below.